Bob Thomson is the managing director of Rhyal Engineering, one of the UK’s leading storage tank contractors, and he approached TimberTech because he was interested in using our high-quality decking products on his newly constructed home overlooking the Milford Haven waterway in West Wales. 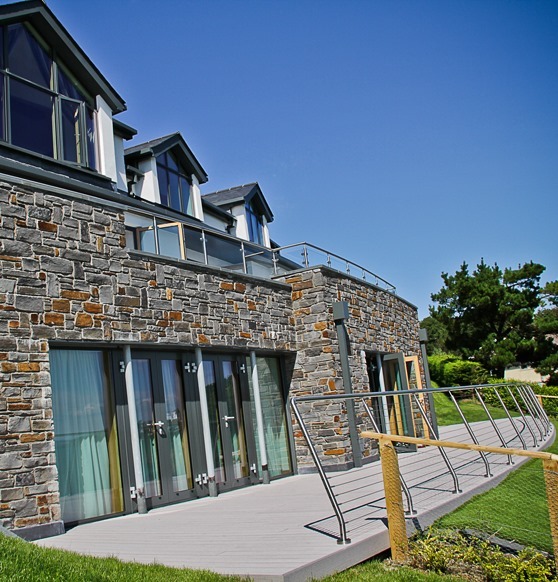 The architect-designed five storey house is quite spectacular indeed, and has been set into the hillside with wonderful views from all levels. Due to the fact that two balconies were required – one at the living level and one below at the bedroom level – this installation was really two projects in one! Mr Thomson wanted to give his home’s exterior spaces a sleek, modern look, and we had plenty of ideas for his beautiful balconies. Bob’s architect worked closely with our in-house architect, Phil, who provided in-depth designs for both balconies and collaborated with the customer to ensure that everything was as he had envisioned. We provided plenty of deck inspiration and ideas for the project and this made it much simpler for the house and deck architects to produce and agree on the best layout. "We were looking to install a high quality, contemporary decking system with a long and trouble free service life, so we contacted TimberTech and went along to their Cardiff showroom to see what they had to offer. We liked the look of the product straight away and were impressed with the helpful information provided and the willingness of Jason and his team to provide a fully inclusive quotation for the design, supply and installation. We would also like to point out that it is much better to view the products first-hand and not to go on what can be seen in the brochure. Jason provided us with a few samples of what we liked and we took them away to decide on which suited us best. 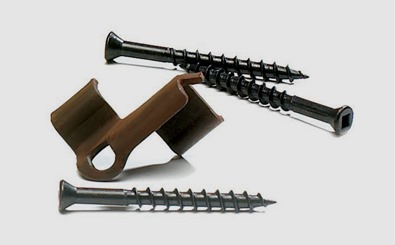 After that, we agreed on the cost and after placing an order, the seamless TimberTech service took over. All materials were delivered on time and the excellent installation team did a great job for us. We are overjoyed with the result and would have no hesitation in recommending TimberTech to anyone else." 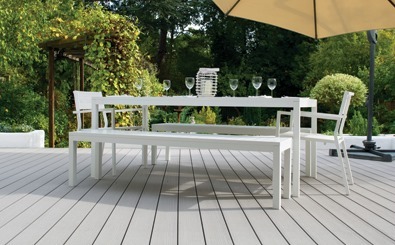 We used VertiGrain 2 decking for this project, as these boards have a natural-looking surface that’s far superior to most artificial decking products, and our ingenious CONCEALoc® fasteners made sure that minimum fixings were visible in the finished decks. Grey VertiGrain 2 decking was chosen for both balconies to complete the slick, contemporary look required, and this contrasts wonderfully with the natural wooden grain. 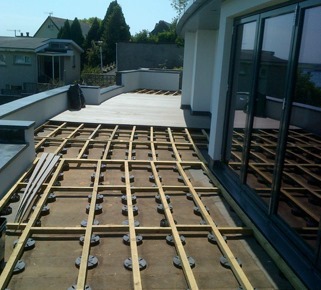 Once Bob and his architect were satisfied with the designs that we had drawn up, it was time for our professional decking installation team to get to work. Mr Thomson’s twin balcony job was among the larger projects we’ve undertaken in our time, taking two weeks to complete! The end result was that all of Bob’s plans came to fruition, and everyone involved was very proud of the result. 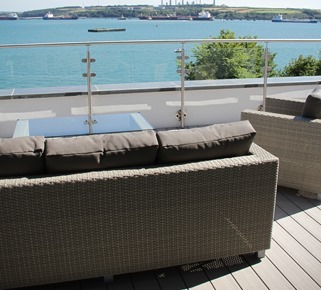 The home’s upper balcony is now a resplendent outdoor seating area, finished with a gorgeous glass balustrade that looks great without taking away from the stunning sea view. Below that is the larger of the two balconies, now a wide open space with plenty of room for relaxing outdoors. 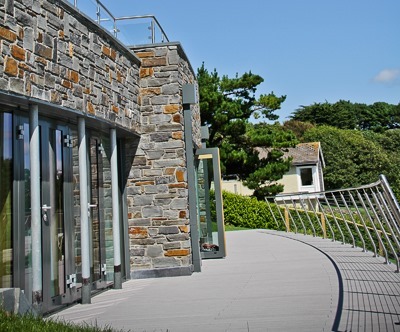 The grey decking looks great against the multi-coloured natural stone walls and access via the bi-fold doors helps to create a smooth, seamless look. We’re overjoyed by how good Mr Thomson’s finished balconies look, and judging by the testimonial above, he’s extremely pleased with the service he received from TimberTech. If you’d like to discuss balcony ideas with us, call 029 2080 3756 or email info@timbertechuk.co.uk. Whether you need an outstanding design, a professional installation, or some high-quality decking materials, we’d be thrilled to hear from you.